Decorative spray paint that gives a vintage look to furniture, mirrors, picture frames and ornaments. 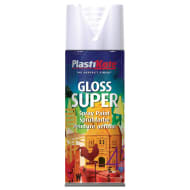 Plastikote Chalk Spray Paint provides a slick, ultra matt, chalky finish. Use with Leaf as a base layer and rub back to create a distressed look.